"And in 'Fatal Love' there is 'Magic Carpet' by Iftikhar and Elizabeth Dadi. 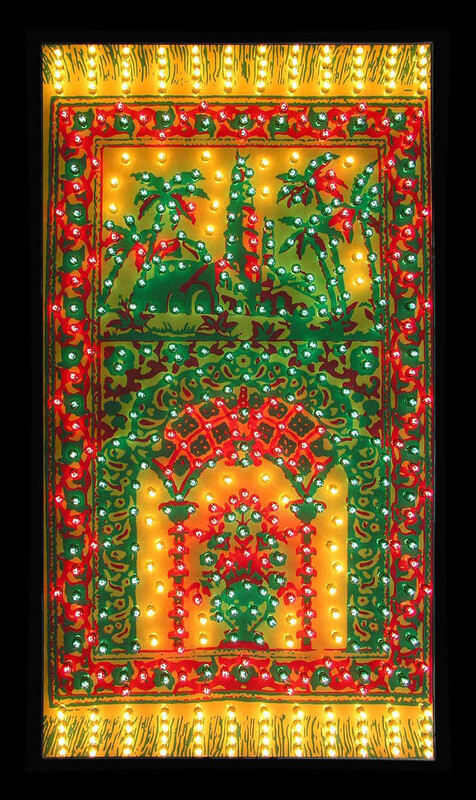 Installed with the Queens Museum's famous relief map, 'Panorama of the City of New York,' it is an image of a patterned Oriental rug made from hundreds of colored lights, and it hovers, glowing, over the section corresponding to the museum's location. It can be taken as a comment on cultural nostalgia or Orientalist fantasy, or as an immigrant's impossible dream of transport home. For the moment, let's see it as other things: as an affirming emblem of the South Asian-American presence in New York, so bright. And as a beacon of welcome to South Asian artists who have arrived in this city in force at last, with their openhearted, profoundly rooted, morally committed art."